Justice Kem T. Frost holds Place 7 on the 14th Court of Appeals and is seeking re-election in 2008. 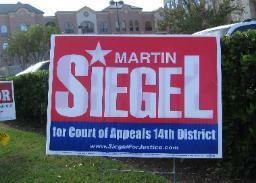 Martin J. Siegel (D). Click on candidate names above to go to their respective web sites. Frost was born in 1958. She is a graduate of UT and received her JD from Texas Tech in 1983. Attorney Kem Thompson Frost practiced civil and appellate law prior to becoming a judge. Frost first joined the court in 1999 as a Bush appointee. as seen in a comparatively large number of concurring and dissenting opinions. the largest number of separate opinions among all member of the First Court of Appeals. 14-07-00204-CV The Travis Law Firm, A Professional Corporation v. Woodson Wholesale Inc.
prejudice, with respect to the order granting the motion to compel. 14-07-00369-CV The State of Texas v. Clear Channel Outdoor, Inc.
14-07-00150-CV Ahmad Moutasse, Rajar Pacha, M.D., Individually and d/b/a Moutassem Rajar Pacha, M.D., P.
14-07-00270-CV Dan Kelly and Laura Hofstatter v. General Interior Construction, Inc.
14-07-00387-CV In the Interest of T.D.N. 14-07-00096-CV Clear Lake City Water Authority v. Friendswood Development Company, Ltd.
14-05-01090-CV Environmental Procedures, Inc. and Advanced Wirecloth, Inc. v. George E. Guidry, Dwight W.
Andrus, III, Dwight W. Andrus Insurance, Inc., and Lexington Insurance Co.
Concurring and Dissenting Opinion by Justice Frost in Robert A. Rakowski and Clear Creek Civic Association, Inc.
14-07-00469-CV In Re Aspen Technology, Inc.
WesternGeco, L.L.C. and Schlumberger Technology Corporation v. Input/Output, Inc.
14-06-00078-CV Mark A. Cantu v. Howard S. Grossman, P.A. Kaplan Pulanski & Ziber P.C. En banc review of this case is necessary to secure and maintain the uniformity of this court's decisions. damages for physical injuries can be recovered under appellee Houston West Corp.'s negligent-retention claim. 14-06-00849-CV Resource Health Services, Inc. v. Acucare Health Strategies, Inc.
14-06-00254-CV Sandra Adair, Et Al v. Veritas DGC Land, Inc.
14-06-00129-CV Scott Fish v. Marsters Company, Frank H. Marsters, Individually and Pedigo Services, Inc.
causation precludes summary judgment, we reverse and remand. appellate jurisdiction over Dr. Young’s appeal from the denial of her plea to the jurisdiction because she is not a governmental unit. denying the Summary Judgment Motions as to Dr. Young. judgment in favor of the landlord. We affirm. Did Not Cover Mold Damage Caused by Leaky Roof; plaintiffs failed to segregate damages by source. 14-05-00206-CV Harveston Securities Inc. v. Narnia Investments L.T.D.